Disa Västberg was a member of parliament for the Swedish Social Democratic Party and she was the chair of Social Democratic Women in Sweden from 1936 to 1952. Disa Västberg was born in 1891. She grew up in a poor working-class family in Klampenborg, a village built around the sawmill industry, near Sundsvall. Her father worked at the sawmill. Accounts of Disa Västberg’s life reveal that it was her childhood experiences of injustice and scarcity that led to her involvement in the workers’ movement. As a 12-year-old she became an active campaigner for sobriety by joining the Godtemplarorden. It has also been said that she worked at a café as a young adult and that she had an illegitimate daughter called Maj Leontina in 1910. When she was 20 she married Mauritz “Moje” Västberg, editor of Nya Samhället, a social democratic morning paper in Sundsvall. They had a son, Gunnar Västberg, together. Disa Västberg joined Medelpad’s Social Democratic women’s association and when the local Social-Democrat women’s district was established in 1917 she was elected its chair. She remained in post until 1928. She was frequently engaged for public talks, travelled around, gave a lot of lectures, and set up new clubs. She made a major contribution to organising working women both before and after 1920 when Social Democratic Women in Sweden was established. 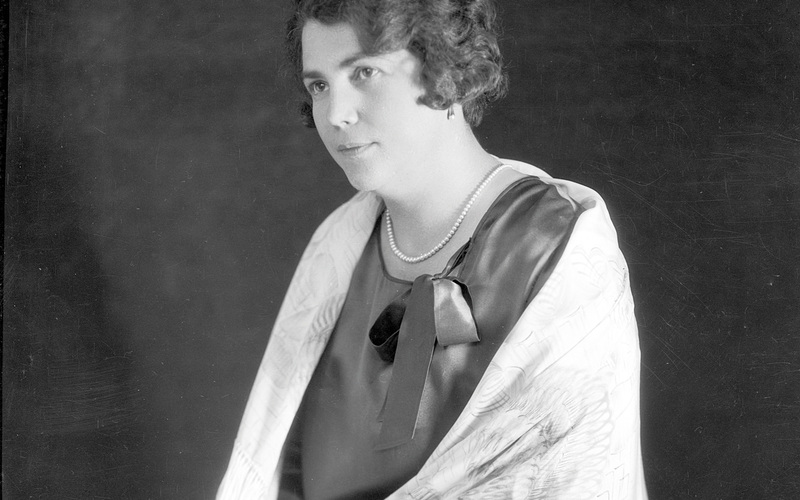 From 1919 to 1923 Disa Västberg was a member of Sundsvall city council and sat on the boards for poor relief and child welfare, as well as on the education board. She was also a member of the county council from 1922 to 1923. In 1923 she and her family moved to Stockholm. At this point Mauritz Västberg had already been serving as a member of parliament in the second chamber for over ten years. Disa Västerg released her first book in 1934 entitled Och Lena tog ordet. Two years later she published Och Lena går vidare. These books portrayed a working woman’s career and were published on behalf of the workers’ movement. Disa Västberg was elected chair of Social Democratic Women in Sweden in 1936, and she brought her broad political experience and enthusiasm for reform to the role. When she assumed leadership, the association was in financial trouble and its relationship with the party was not well defined. Membership in the Social Democratic Women in Sweden increased from around 17,000 to around 60,000 during her period as chair. Disa Västberg was also editor-in-chief of the Morgonbris paper until 1952, when she resigned as chair. Further, she was an active member of the paper’s editorial team and also served as editor for a time. Disa Västberg was a member of parliament in the second chamber from 1941 to 1956. She was a substitute on the legal commission from 1943 to 1952 and a full member from 1953 to 1956. Further, she was a member of the public planning commission from 1950 to 1952. Disa Västberg soon became involved in investigative work and was elected onto the Census commission from 1936 to 1938. She served on the conscription committee in 1938, on the refugee aid committee in 1940, on the employment commission the same year, and in advisory agencies for the social aid authority in 1944. She became a member of the board of Arbetsmarknadsstyrelsen (AMS, employment board) in 1948. Most of the motions she put forward concerned children. This could entail sandboxes in greenbelt areas, the setting up of childcare centres to benefit children’s health, children’s day care centres, sexual education in schools, proposals for school meals, improvements in maternity care, renovation of young offenders’ detention centres, accommodation services for unmarried mothers, children’s welfare issues, and appropriate children’s films as well as affordable children’s books with appropriate contents. On the occasion of Disa Västberg’s 60th birthday the festschrift Socialdemokratisk kvinnogärning was published. Disa Västberg died in 1966. She is buried at Skogskyrkogården in Gamla Enskede in Stockholm. Rebecka Desideria (Disa) Västberg, www.skbl.se/sv/artikel/DisaVastberg, Svenskt kvinnobiografiskt lexikon (article by Irene Andersson), retrieved 2019-04-22.